This mod increases the capacity of the headlight circuit to handle high power bulbs without risk of damage to the existing headlight circuit. Power is supplied to the filaments via separate circuits that are activated by a dual relay, which in turn is controlled by the original headlight power circuits. Consequently, the power through the original circuit is significantly less than stock, which should increase the lifetime of that circuit, especially the high-low beam switch. This mod is easily done in one evening and costs about $38 not including the high output bulb - assuming you get the relay at other than a Chrysler dealer - they want $48, while Pep Boys wants $24. 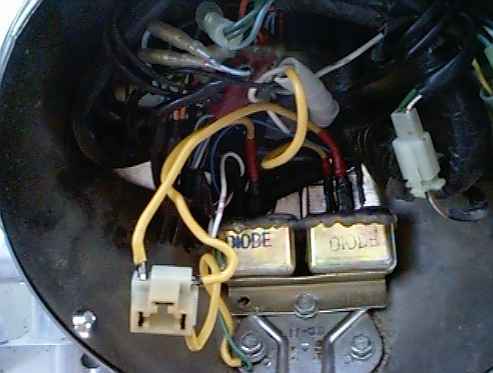 1 dual relay for Chrysler convertibles, see diagram for various PN's. Remove the seat, gas tank and the headlight. Disconnect positive lead on battery. Solder 12GA wire to one end of the inline fuse wire after positioning shrink tube on the wire. Shrink the tube over the splice. Drill appropriate hole in fitting on end of main battery cable. Strip 1/2" of end of other wire on inline fuse, form into loop to fit screw, tin it with solder and affix the wire to the cable with the screw. Run the 12GA wire along the frame taking care it is not subject to pinching from anything (like the tank) and secure it with wire ties. Pass the wire through the hole in the back of the headlight shell, and slip the loom sleeve over it. Pass the loom half way through the hole and secure it to the other wire looms with small wire ties. Cut the wire off, leaving about ten inches beyond the end of the loom. 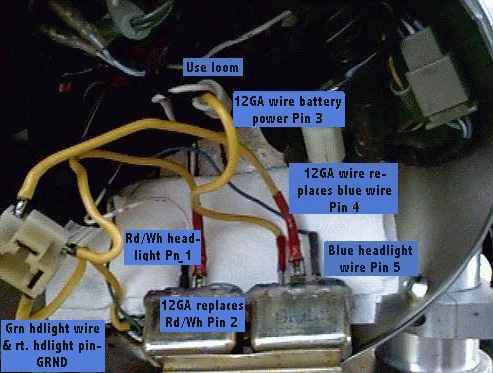 Cut the wires close to the headlight plug. Carefully remove the contacts from the plug (depress the spring catch on the brass). Open the crimp using a sharp tool, remove the wire. 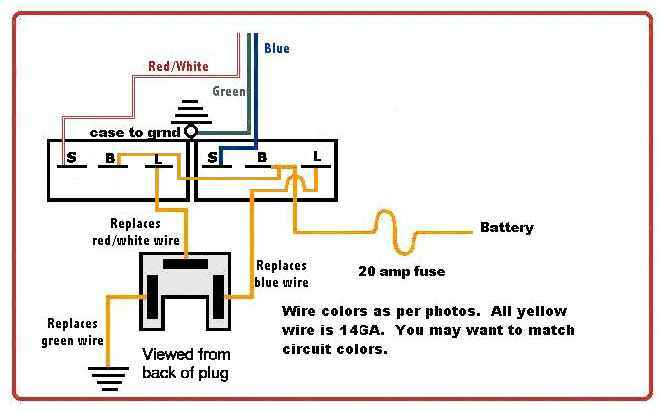 Referring to the wiring diagram and the picture, assemble the circuit in the diagram using the connectors, heat shrink tubing, electrical tape, solder, and three pieces of the 12GA wire each about ten inches long. Carefully reuse the three plug contacts by re-crimping them. (I also soldered them, and have not had a problem with the solder melting yet, but I expect that might be possible.) Use one of the forward screws in the bottom of the headlight shell to ground the two wires, using the washer. Bend the mounting flange of the relay, and open the hole slightly to mount the relay using the rear bolt in the bottom of the shell. Also NOTE - the headlight shell gets a lot of water in it - so use a hot glue gun and seal the back of the relay. Use heat shrink tubing and electrical tape to completely insulate the quick disconnects. Reconnect the battery and do a smoke test. I'm not done testing this yet, but I suspect I am going to conclude the 130/90 bulb generates too much heat; use one of the lesser wattage bulbs, like the 100/80. You may also want to aim the light a little higher to use all those watts - I found 1 turn in on both adjusters was just right to light up the road for 1/2 mile.